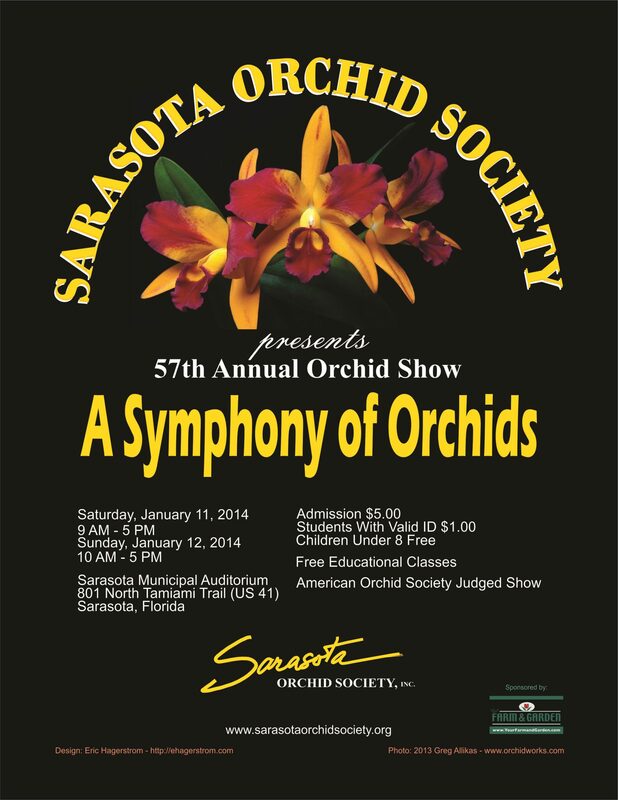 The Sarasota Orchid Society presented their 58th Annual Orchid Show & Sale on January 3 & 4, 2015. This American Orchid Society sanctioned show was held at the Sarasota Municipal Auditorium, 801 N. Tamiami Trail, US #41, Sarasota, Florida 34236. Show hours were Saturday 9 am – 5 pm and Sunday 10 am to 5 pm. Admission charge is $5.00, Student with valid ID $1.00, children under 8 are free. 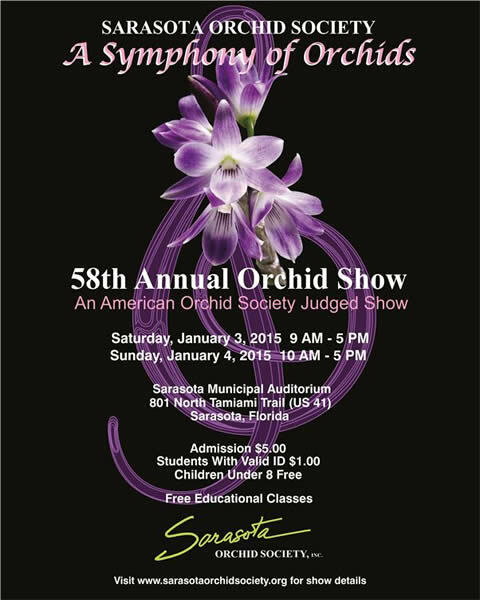 “A Symphony of Orchids” the theme for Sarasota Orchid Society’s 2015 Celebration, showcased thousands of award-winning orchids in displays created by orchid vendors and local orchid societies. A variety of orchids and orchid related accessories were available for purchase from expert orchid growers and artists from the state of Florida, including Florida SunCoast Orchids, Palmer Orchids, Art Stone Orchids, Krull-Smith Orchids, Phelps Farm Orchids, Chapman’s Orchids, Louis Del Favero Orchids, Odoms Orchids, Plantio La Orquidea, Hicks Orchid Supplies (Orlando), our Farm and Garden (Sarasota) Orchid Artists Designs by Dawn Montanbault & Artwork products by Cora Sanders, Orchid Ceramic Designs by Judy Robertson, Nature on the Rocks, Stig Dalström Botanical Art and more. Throughout the two show days, visitors had the opportunity to interact with the growers, purchase orchids and related items, and to immerse themselves in the beauty of orchids. Educational Orchid Growing seminars will be presented on Saturday and Sunday by our local growers. Your Farm & Garden Supply was the proud sponsor of the Sarasota Orchid Society 58th Annual Orchid Show. 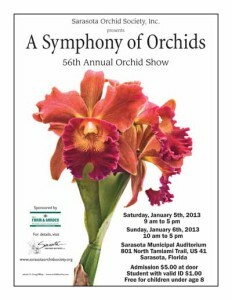 The Sarasota Orchid Society presented their 56th Annual Orchid Show & Sale on January 5th & 6th, 2013. “A Symphony of Orchids” the theme for Sarasota Orchid Society’s 2013Celebration, showcased thousands of award-winning orchids in displays created by orchid vendors and local orchid societies. A variety of orchids and orchid related accessories will also be available for purchase from expert orchid growers and artists from the state of Florida, including American Travel Group, Art Stone Orchids, Byrd Orchids, Canaima Orchids, Chapman’s Orchids, Florida Sun Coast Orchids, Hicks Orchid Supplies, Joe Hayden Orchid Mounts, Orchid Artist Jone’ Ritchie, Orchid Ceramic Designs by Judy Robertson, Marie Selby Botanical Gardens’ Book Store, Nature on the Rocks, Odom’s Orchids, Plantio La Orquidea, Stig Dalström Botanical Art, The Orchid Specialist, and more. Throughout the two show days, visitors had the opportunity to interact with the growers, purchase orchids and related items, and to immerse themselves in the beauty of orchids. Educational seminars will be presented on Saturday and Sunday by our local growers. 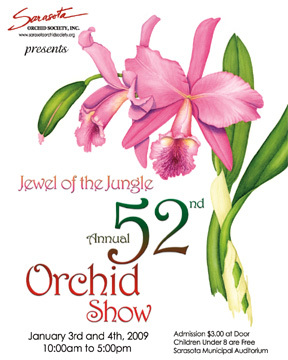 Your Farm & Garden Supply & Marie Selby Botanical Gardens are proud sponsors of the Sarasota Orchid Society 56th Annual Orchid Show. 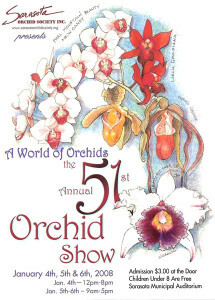 The Sarasota Orchid Society presented their 54th Annual Orchid Show & Sale on January 8th & 9th, 2011. 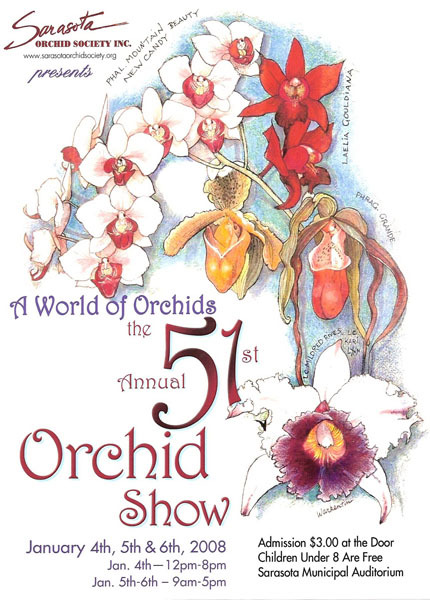 This American Orchid Society sanctioned show was held at the Sarasota Municipal Auditorium, 801 N. Tamiami Trail, US #41, Sarasota, Florida 34236. Show hours are Saturday and Sunday 9 am to 5 pm. Admission charge is $5.00 children under 8 are free. “Wild About Orchids” the theme for Sarasota Orchid Society’s 2011 Celebration, will showcase thousands of award-winning orchids in the displays created by orchid vendors and local orchid societies. A variety of orchids and orchid related accessories will also be available for purchase from expert orchid growers and artists from the state of Florida, including American Group Travel, Byrd Orchids, Canaima Orchids, Chapman’s Orchids, Featherstone Orchids, Florida SunCoast Orchids, Hicks Orchids Supplies, Jone’ Ritchie Artist, Judy Robertson Orchid Ceramics, Krull-Smith Orchids, Marie Selby Botanical Book Store, Marie Selby Botanical Garden, Nature on the Rocks, Odom’s Orchids, Orchids Etcetera, Plantio La Orquidea, Stig Dalstrom Botanical Art, The Orchid Specialist, and much more. Breathtaking displays of orchids will be showcased by Sarasota Orchid Society, and many other local orchid societies and Marie Selby Botanical Gardens. Throughout the two show days, visitors will have the opportunity to interact with the growers, purchase orchids and related items, and to immerse themselves in the beauty of orchids. There were also be educational classes given by our local growers. Hibbs Farm & Garden Supply & Marie Selby Botanical Gardens were proud sponsors of the Sarasota Orchid Society 54th Annual Orchid Show. 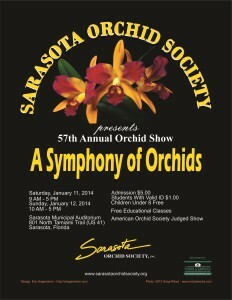 The Sarasota Orchid Society presented their 53rd Annual Orchid Show & Sale on January 9th & 10th, 2010. This American Orchid Societysanctioned show was held at the Sarasota Municipal Auditorium, 801 N. Tamiami Trail, US #41, Sarasota, Florida 34236. Show hours are Saturday and Sunday 9 am to 5 pm. Admission charge is $5.00 children under 8 are free. “Days of Wine and Orchids” the theme for Sarasota Orchid Society’s 2010 Celebration, showcased thousands of award-winning orchids in the displays created by orchid vendors and local orchid societies. A variety of orchids and orchid related accessories will also be available for purchase from expert orchid growers and artists from the state of Florida, including B&D Orchids, Byrd Orchids, Canaima Orchids, Chapman’s Orchids, Featherstone Orchids, Florida SunCoast Orchids, Hicks Orchids Supplies, Jone’ Ritchie Artist, Marie Selby Botanical Book Store, Nature on the Rocks, Odom’s Orchids, Orchid Mania, Orchids Etcetera, Plantio La Orquidea, Stig Dalstrom Botanical Art, and much more. Breathtaking displays of orchids were showcased by Sarasota Orchid Society, and many other local orchid societies and Marie Selby Botanical Gardens. Throughout the two show days, visitors had the opportunity to interact with the growers, to purchase orchids and related items, and to immerse themselves in the beauty of orchids. There will also be educational classes given by our local growers. Hibbs Farm & Garden Supply & Marie Selby Botanical Gardens are proud sponsors of the Sarasota Orchid Society 52nd Annual Orchid Show.